"You gotta play the game to change the game." A young 20-something Jermaine Cole made these words the mantra for his career. He has been through his up-and-downs, suffered through his fair share of criticism, and wound up cultivating one of the strongest followings of any hip hop artist. With 4 Your Eyez Only, J Cole continues to carve his own lane as an artist and push his art to another level. J. Cole pulls out all the stops on 4 Your Eyez Only, expanding on the slow jams and extended narratives of his previous album 2014 Forest Hills Drive. Once again, Cole has a hand in producing a majority of the tracks and doesn't enlist any other rappers for features. Behind his vocals are beautiful horns, strings, keys, and bass all over the album. 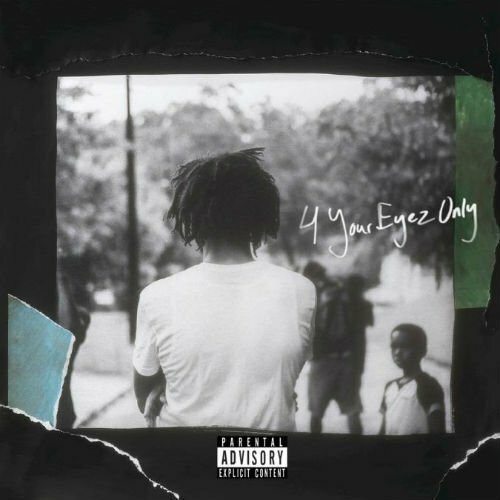 The soothing keys of “Ville Mentality” and the lamenting horns on “4 Your Eyez Only” encapsulate a record that is rooted in classic jazz and R&B with biting hip hop lyricism. The penmanship from J Cole is excellent, with descriptive, emotional, and hard-hitting lyrics. While many songs may sound auto-biographical, the concept of the LP follows the story of a character named James McMillan Jr., whose tragic death at the age of 22 offers glimpses into the beauty and ugliness of life on the streets and society at large. Often these allusions remain cryptic, and Cole himself has not come out and said anything about whether this story is true, fictional, or somewhere in between. Second track "Immortal" has Cole utilizing McMillan's larger than life perspective and struggling with thoughts of being remembered more fondly after death than in growing old and being scrutinized. On "Neighbors," he speeds up his delivery while discussing being stereotyped and misrepresented by people who do not know him. Self-produced, the track is a great representation of J. Cole’s versatility as a writer, producer, rapper, and singer. While "Ville Mentality" includes an eery, emotionless interlude by a young girl describing her father's untimely demise, the beautiful "She's Mine Pt. 2" gives a deeper introduction to her, as she's revealed to be McMillan's daughter. He offers introspection on the vanity within the world and the newfound insight for loving the little things in life, like being a father. The subtle keys and strings dancing in the background round out what turns out to be a touching tribute from a father to his child. Closing out 4 Your Eyez Only is the near-nine minute epic title-track. Set to mournful horns and wailing strings, Cole offers some of the most visceral, poetic, and vivid lyricism of his career. The theme of the record comes out in full force, as Cole delivers an emotional eulogy meant for his friend's young daughter. 2016 has seen the young leaders of hip hop push the envelope and reinvent themselves. Kendrick Lamar did it on untitled.unmastered, Chance the Rapper offered The Coloring Book, and now J. Cole has released 4 Your Eyez Only. At ten tracks and just over 49 minutes, uncompromising storytelling with impeccably evocative instrumentation coalesce to deliver an extremely powerful experience. Songs we like: "For Whom the Bell Tolls," "Immortal," "Deja Vu," "She's Mine Pt.1," "Neighbors," "Foldin Clothes," "She's Mine Pt.2," "4 Your Eyez Only"
Purchase 4 Your Eyez Only now on Amazon and stream the full album above for free courtesy of Spotify. "1985 - Intro to "The Fall Off""